Charmlee Wilderness Park and Bluffs Open Space Preserve are both within the boundaries of the Santa Monica Mountains National Recreation Area and both are publicly owned open space. In 2014 under terms of the lease, the City of Malibu assumed management of the 84-acre Malibu Bluffs Open Space Preserve and the Conservancy took on management responsibilities for the 532-acre Charmlee Wilderness Park. View of Malibu from Charmlee Wilderness Park, where many of the trails lead to exquisite views of the sea, the Channel Islands, Catalina, and the Point Dume area of Malibu. 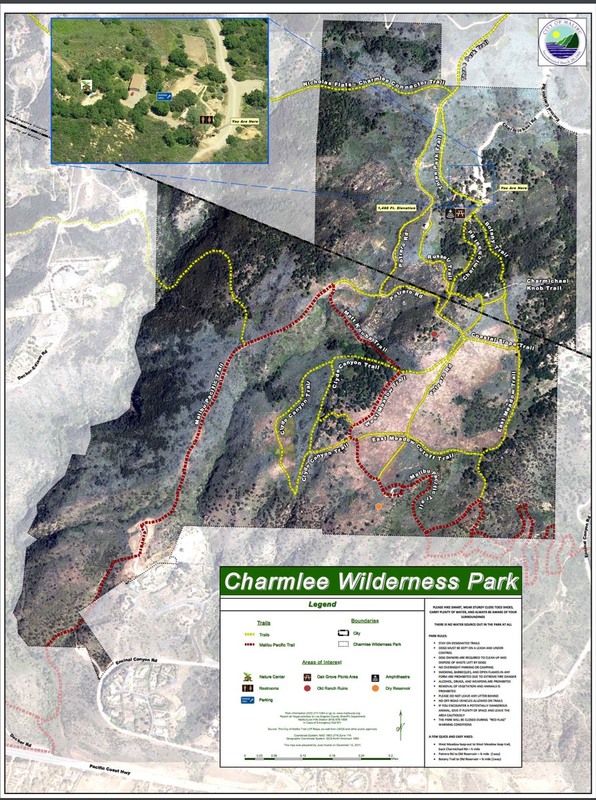 Aerial trail map of the 532-acre Charmlee Wilderness Park, which offers scenic hiking experiences under old oaks and amid a variety of habitat types.